As a developer of retail projects, I understand that means putting more money at risk during due diligence. As an engineer, I’m also aware that there’s valuable information we can gain during this phase to set a clear path to quickly move a project through the land development process. In this industry, we certainly know that time is money! The faster you deliver a site, the sooner you lock in your top tenant and generate rental income. This is especially important for pad sites, where a greater return on investment can be realized. The sooner you identify what can go there and how much it will cost to develop, the better off you’ll be. You can also provide an estimated delivery date to your potential tenant. During due diligence, you’ll want to engage your engineering and planning consultant. They should provide an accurate timeline of the approval process, a viable stormwater management program and a schematic site design – so you can confirm that the construction estimate matches your budget. You need your engineer to tell you how tough the local and state officials may be or how long it takes to get stormwater and grading permits. They should identify hidden risks (title encumbrances, environmental issues and utility conflicts), as well as, offsite improvements needed for roadway or utility extensions. Armed with this information, you can meet with the reviewing agencies to go over the key design elements. If you can garner their support in the application phase, the submission process will always go faster. In the end, eliminating one submission can make a big difference in the schedule. Beyond the schedule, your consultant plays a key role to meet the requirements of retailers. They have two jobs during the sketch plan phase – maximize the building and pad site square footage and make sure these sites are viable. Sketch plans are only valuable if they’re buildable. This is especially true for the redevelopment of existing shopping centers. Finding one extra pad site near the entrance makes a project go from good to great! • Existing stormwater facilities: Are they located in key leasing areas? Can you relocate them? • Parking: Can you shift the parking lot layout or relocate an entrance to create a new pad site? • Municipal Ordinances: Are there ways to get credits for shared parking to add more square footage? 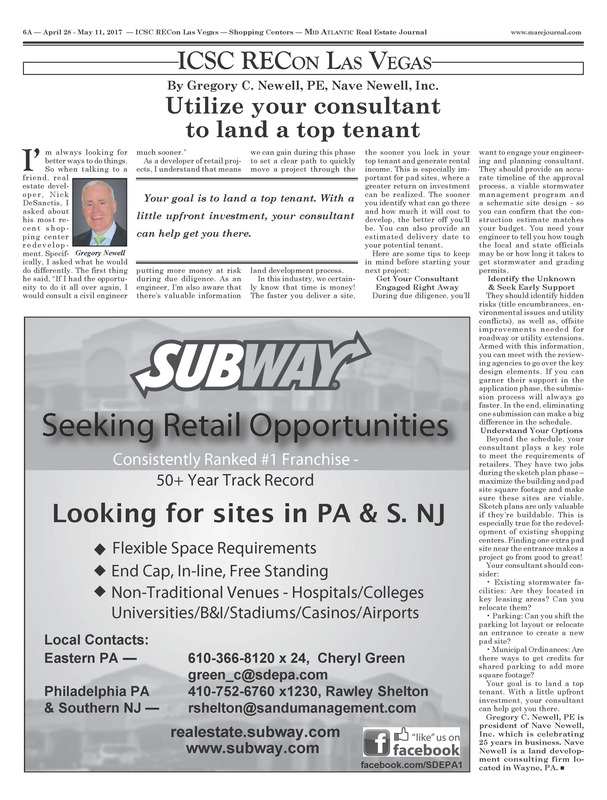 Your goal is to land a top tenant. With a little upfront investment, your consultant can help get you there. Written by Gregory C. Newell, PE. Greg is president of Nave Newell, Inc. which is celebrating 25 years in business. Nave Newell is a land development consulting firm located in Wayne, PA.